Yohan Hwang is more Filipino than you originally thought. Hailing from South Korea, Yohan Hwang was declared the first grand touristar of the singing competition for foreigners in the country, I Love OPM which was concluded last Saturday, April 23. Aside from his talent for singing Filipino songs, his good looks also captured the hearts of the viewers. 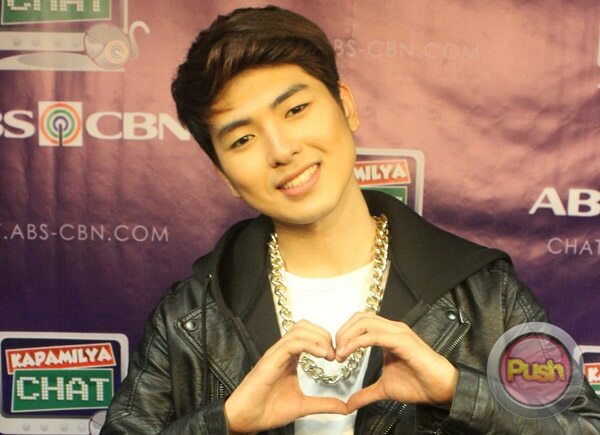 In an exclusive interview with PUSH.com.ph, the Korean singer-heartthrob admitted that winning I Love OPM brought him mixed emotions. “Actually, I had two emotions like the one is super happy and the other emotion was like I was very worried. Is it okay even (if) I got this prize? Something like that. Am I deserving? (I am not) sure if I deserve to win or what,” he said, thinking about the comments of the people. Know more about this Korean cutie by reading his answers to slum book questions below. Dream project/role: Maybe a movie. To be in a love team. I want kilig factor like JaDine or something. Dream leading lady: It should be Anne Curtis. She’s really charming and cute. Describe your dream date: Go to a fancy hotel and eat in a fancy restaurant and give very expensive diamond ring. Describe your ideal girlfriend: She should be mabait first, always concentrating on her work or study and always think about her family. I want very lovable, lovely girl. Describe your ideal vacation: I want to visit Boracay talaga. I want to swim, I want to eat food there, I want to see the views. It’s my dream. If you were stuck on an island, who do you want to be with and why? Maybe with my best friends so that we can survive. We can do whatever we want and we might have a great experience in surviving. Collection: Shoes. I think I have more than 10, like 15 pairs of shoes. It’s not a lot but kind of collection. Who is/are your closest friend/s in showbiz: I can say among the Touristars, Ryan, the American. Pets: We have dogs in my house, huskies. They’re very cute, right? I think more than 10 huskies. We have a farm, husky farm kasi my family loves dogs more than me. (To take care of them), we just give food and water and we go out, exercise together.